In the early 1990’s Kristiane Backer was one of the very first presenters of MTV Europe. For some years she lived and breathed the international music scene, quickly gaining a cult following amongst viewers and becoming a darling of European press. As she reached the pinnacle of her success she realised that, despite having all she could have wished for, she was never truly satisfied. Something very important was missing. A fateful meeting with Pakistani cricket hero Imran Khan changed her life. He invited her to his country where she encountered a completely different world from the one she knew, the religion and culture of Islam. Instead of pop and rock stars she was meeting men and women whose lives were dominated by the love of God and who cared very little for the brief glories of this world. She began to read the Quaran and to study books about the Faith. 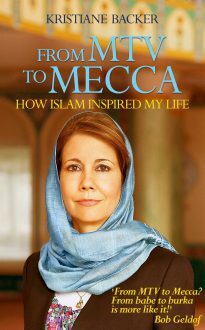 A few years later, after travelling more widely in the Islamic world and knowing that she had discovered her spiritual path, she embraced Islam in a London mosque. And then her real adventures began.